The pace of change in today’s technology is just mind boggling. Many of the gadgets we take for granted now were science fiction only a few years ago and over the next 20 years, the power of the chips and circuits under the hood along with development in AI and automation will probably change the world more than even the industrial revolution or the invention of the iPhone (chuckle). We enjoy the benefits, but hidden from us are many of the costs, including massively increased energy demands and piles of e-waste as we switch to new models more and more quickly. Individually, we can do our bit by holding onto our tech for a little bit longer and properly recycling it when it's had its day. Furthermore, we can keep an eye on our energy usage, reducing pollution and even save some money at the same time. If that all sounds a bit dull, read on because there is a gadget that can help that can actually make being a bit greener, a bit more fun! This is the Loop and it recently topped a product round-up for its accuracy measuring a house's energy use in Which? magazine. The actual gadgets that you get are not the most attractive. No brushed aluminium and gorilla glass here. No, but the Loop hardware's job is to clamp round the electricity main coming into your house and measure the flow of electrons as your kit burns through the kilowatt hours. The second bit connects to your router and throws the data into your Loop account where you can look at it from the brushed aluminium and gorilla glass clad gadget that you’ve already got. There’s tons to look at on the website and hopefully, keep you coming back. Once you’ve completed your house’s profile (give an idea of size, number of occupants etc) - you can dive into the dashboard and see what energy you’ve been burning. Simple graphs chart your week’s energy use and tell you what it cost and where the peak usage was. Once you've built up a decent amount of data, integration with USwitch will help you choose the best deals from energy suppliers, without having to get caught up in the jargon. If you're not on the best deal already, this could lead to surprising savings. It’s not all about the money though and folks nursing a conscience around the green issue of CO2 output can also see what the household contribution is to global warming. Even if you’re not massively moved by this, it’s quite interesting to note what alternatives the energy might have bought you. For example, in the screen-grab below, the week’s electricity usage would have pumped out the same amount of CO2 as 1635 miles by train! Finally, if money and global harmony are not strong enough motivators, then you can set yourself some energy reduction goals of your own and turn it into a sort of game. There are some built in, like the ‘Super Saver’ at 3% and ‘Life Changer’ at 5%, but you can also set your own. Once triggered, you’ll get alerts along the way to help you keep on track. If there was ever an interesting gadget you can buy without feeling guilty about it, it’s the Loop. The various charts and graphs will keep the data geeks happy and the goals can work as good motivators for everyone else to do their bit and reduce energy usage. 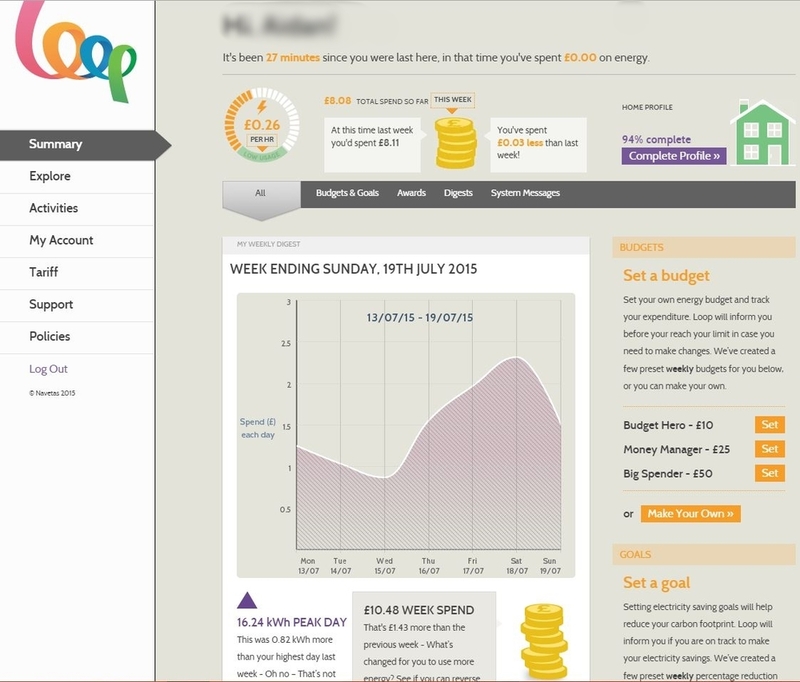 On the main page, there is a near-realtime monitor showing your energy usage ‘now’. It’s quite interesting to go around the house and switch gadgets on and off to see what impact they have. For most people, it won’t take long to realise that the standby on the TV really doesn’t have much of an impact, but that fridge that keeps freezing your milk is costing a bomb! Used properly, the Loop could pay itself back in no time, so well worth considering.